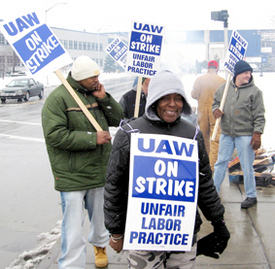 DETROIT — More than 3,650 members of the United Auto Workers at American Axle have been on strike in Michigan, Indiana and New York since Feb. 26. The strike is affecting General Motors operations throughout North America. GM’s Detroit-Hamtramck assembly plant, which makes the Buick Lucerne and Cadillac DTS, was officially idled March 31. In addition, seven GM light-truck assembly plants are closed, along with 22 parts operations in North America. Several suppliers also have slowed or idled plants that supply GM. American Axle called back 140 laid off workers March 31 who returned to work long enough to say they are out on strike and immediately joined the UAW picket lines outside the plant. “Not to boast or anything, but we’re fighting for all of Middle America,” said Adrian King, president of UAW Local 235. On picket lines throughout this city workers repeat that sentiment. Despite company threats, their resolve appears strong. From all over Michigan and into Ohio, UAW locals are coming to Detroit to walk the lines and give support. Local 142 from nearby Warren set up a BBQ and fed hundreds over a four-hour period. With 29 GM plants entirely or partially shut down, the pressure is mounting on American Axle to negotiate seriously. Despite $37 million in profits last year the company is seeking massive wage and benefit cuts. The company has set up non-union plants in the U.S., Mexico, Poland, Scotland, India and China. It is estimated that from 2003 through 2006, CEO Dauch received $58 million in compensation. Because the company has provided no data to justify the harsh cuts, the union has charged it with unfair labor practices.